Mitchell B. Hart (Co-editor), Tony Michels (Co-editor). The Cambridge History of Judaism: Volume 8. The Modern World, 1815–2000. Cambridge University Press, 2017. 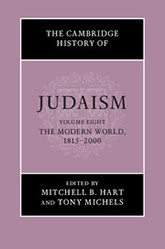 The eighth and final volume of The Cambridge History of Judaism covers the period from roughly 1815–2000. Exploring the breadth and depth of Jewish societies and their manifold engagements with aspects of the modern world, it offers overviews of modern Jewish history, as well as more focused essays on political, social, economic, intellectual and cultural developments. The first part presents a series of interlocking surveys that address the history of diverse areas of Jewish settlement. The second part is organized around the emancipation. Here, chapter themes are grouped around the challenges posed by and to this elemental feature of Jewish life in the modern period. The third part adopts a thematic approach organized around the category ‘culture’, with the goal of casting a wide net in terms of perspectives, concepts and topics. The final part then focuses on the twentieth century, offering readers a sense of the dynamic nature of Judaism and Jewish identities and affiliations.